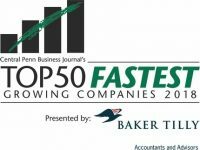 August 21, 2018 (Middletown, Pa.) – Premiere #1 Limousine Service ranked on Central Penn Business Journal’s (CPBJ) 2018 50 Fastest-Growing Companies in Dauphin County List, marking the fifth consecutive year. Entering companies were required to submit financial information for review by CPBJ’s editorial staff. Out of more than 2,500 companies in the region, only 33 met the qualifications to make the list, which included comparing and averaging each company’s percentage and dollar growth over one and two years. Premiere ranked No. 10. Along with this recognition, Premiere won a plethora of awards over the years from CPBJ for diverse initiatives such as growth, service to the community, and acknowledgement as a top-rated regional company in different categories. A few previous awards include the 2017 Business of the Year Award in the 51 to 100 Employees Category, multiple finalist qualifications for the Business of the Year Award, numerous rankings on the Veteran-Owned Business List, and countless appearances in the Book of Lists.